We held our daughter's baby shower today. These are a few of the things we gave her. We bought her a clothes hamper that was full to the top with these handmade items along with things we've bought over the last several months. Our grandson that is due at the end of December. I started making things as soon as she found out she was pregnant in April. Our oldest daughter has 2 little girls so we were very excited when she found out that our youngest daughter is was having a boy. I've been surfing the web for baby patterns and have also started subscribing to my favorite blogs to find patterns. 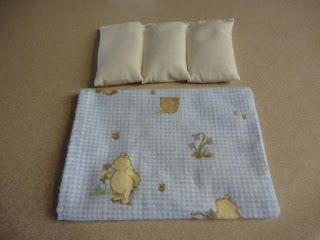 I love quick and easy projects, so none of these take very long at all to make. If for some reason the links in this post don't work, you can also find them on my "Baby" page. I think these little Pee Pee Teepees are adorable! I made the 3 of these in about 15 minutes. 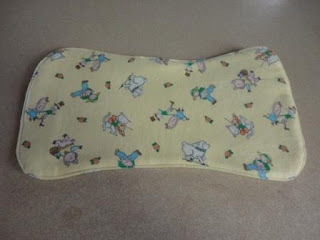 I found this pattern at Little Birdie Secrets. 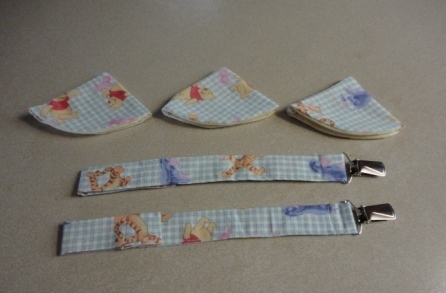 The pacifier holders are also very quick to make. I found this pattern at Sew 4 Home. John Deere receiving blanket. Colton's daddy loves John Deere. I wish I had rounded the corners. 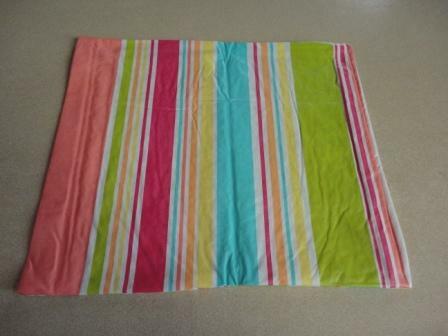 This blanket is 36"x36". I found this material for the front in the remants at Joann's for a really good price. The flannel I used for the back isn't an exact match, but it still looks good. I used brown floss to tie it with. This was a very quick and easy project. 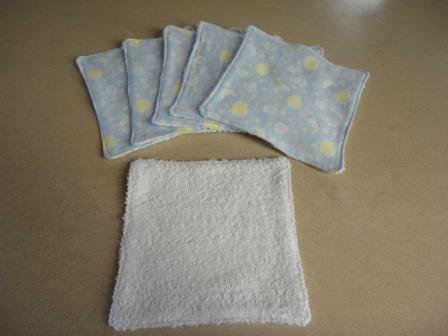 Small Rice Bag. I've been making these for years! They are also very quick and easy. The pattern can be found here. 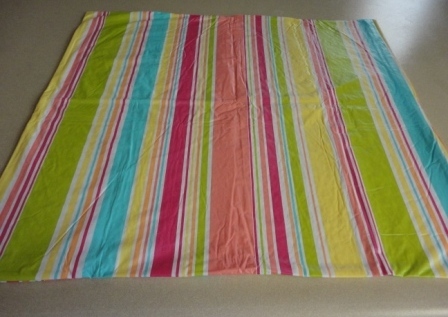 Large vinyl changing pad. 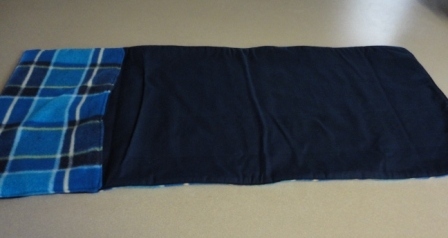 This is made from a rectangle vinyl tablecloth. I was able to get 3 large and 4 small (below) out of one 52" x 70" tablecloth. 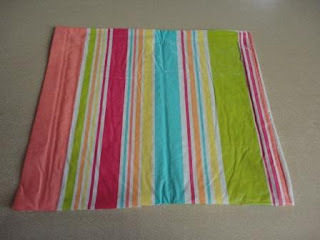 I found the pattern for this at My Creative Stirrings. When my babies were small, we had changing pads that were made out of what felt like starched flannel. 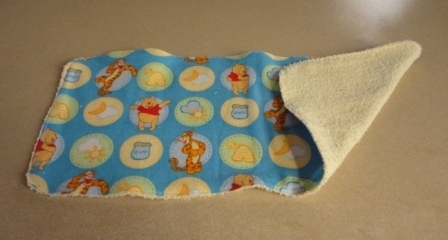 They were just big enough to slide under their little tushes while you were changing them. 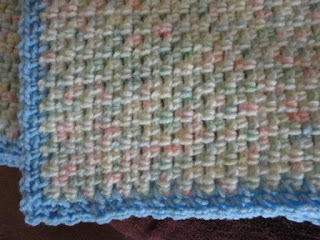 The finished size is 9 3/4" x 10 3/4". 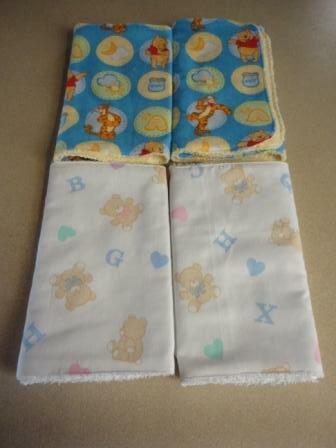 I really liked this burp cloth pattern. It's very easy to make and a nice size. I found this pattern at Craftaholics Anonymous. I love this little blanket! 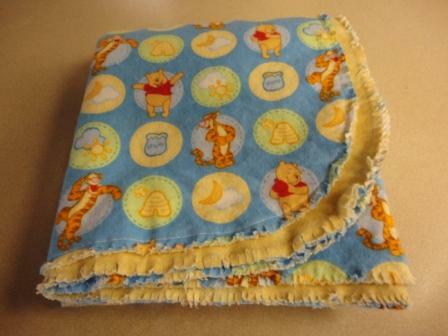 I found this Pooh fabric on clearance at Joann's. I bought all they had which was about 1 1/2 yds. I wish they would have had more. I found this pattern at Sew Much A Do. I LOVE this pattern! I found it on a skein of yarn over 20 years ago. I have made it for years in different color and size variations. It's a very quick and easy pattern. One that you can put down and pick right back up without having to think too much. 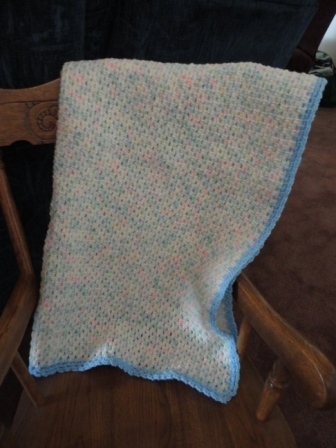 For this one, I used baby varigated yarn and trimmed in in baby blue. I liked it without the blue, but my husband thought it looked too girly. Men. 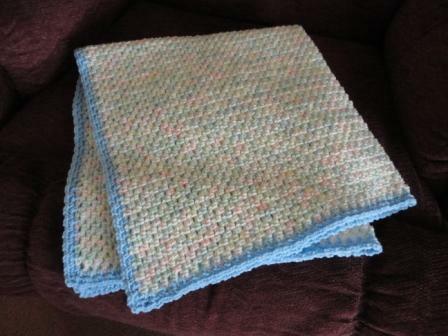 :) Here is the pattern for this afghan that I posted earlier this year. I didn't write it down, but I think I started with a chain of 151 for this one. Finished size is 32" square. 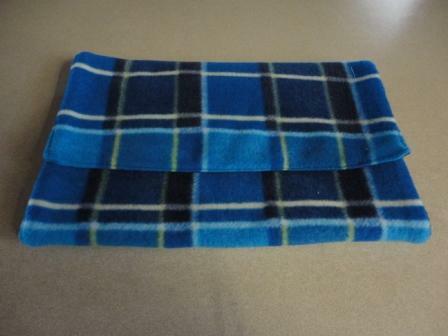 12" Square Fleece Blanket. The other side is plain brown fleece. 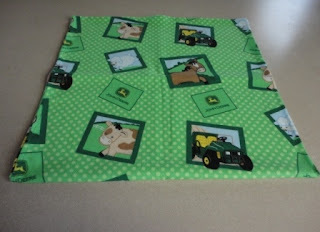 I cut a 12" Square from each fabric and rounded the corners. 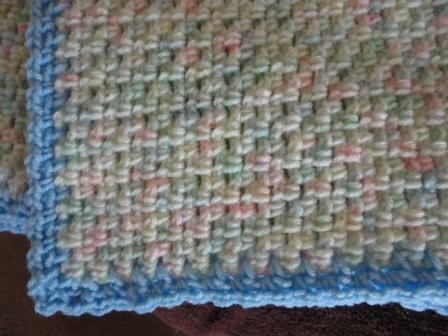 With wrong sides together, I stitched around the outer edge. Small diaper bag. 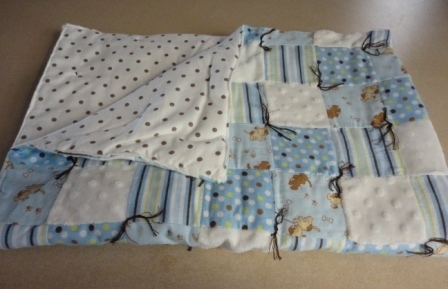 I made this from quilted scalloped squares. 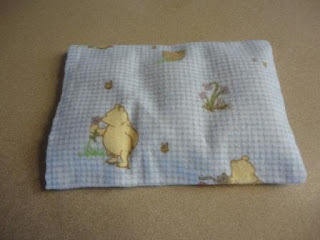 Pacifier Pouch - I also made this from two scallop squares. It has a velcro closure and will hold 2 to 3 pacifiers. The back also has a velcro strap to attach to a diaper bag or stroller. The strap also collapses to store in the diaper bag or purse. Handmade is always so great! Stopping by from the Terrific Thursday Hop. I'm following you by GFC. I'd love if you stopped by my blog too! Have a great day! Wow! You are quite crafty. If you haven't already, you need to open up your own online store to sell some of the stuff you've made! Baby Colton will be one loved little one. I'm due two weeks and I'm behind on making diapers...oh well. Oh my goodness what a fabulous selection of gifts! You've been very busy! What wonderful gifts you made for your grandson. He'll be wrapped in love for sure.